Tax season comes and goes every year, but that does not mean the filing of taxes is completely over once you have autographed the signature line and sent your paperwork on its way. In fact, right around that time is when a few taxpayers begin to feel doomed because for whatever reasons: a forgotten 1099 or deduction, or an overlooked sale of an investment, among a whole array of other reasons, some mistake on your tax return was discovered after the fact. Herein hatches the dilemma – to amend or not to amend your tax return. For better or for worse, tax experts seem to agree that if you discover a mistake on your tax return, your best bet is to file an amended return (1040X). It is actually an effort worth making because it becomes a means of mitigating your tax troubles. Namely, once the IRS discovers your mistake – and you can bet these agents eventually will – you will be required to pay the taxes that were due and on top of that face penalties and interest – ouch! It may behoove you to seek the counsel of a tax attorney to ensure you are complying. In particular, areas such as net operating losses, foreign tax credits, bad debts, and overseas financial investments, among others, can require complicated analysis in order to make sure you are filing correctly. To be clear, “underpayment” is the difference between the correct amount of tax and the tax which was reported on the return. In a nutshell, once you become aware of the mistake, you should be quick to file a QAR. The tax amount you report on the QAR shall be treated as if it were reported on your original return; and therefore, you can avoid the accuracy-related penalty. Very much like a voluntary disclosure of a foreign bank asset, a qualified amended return gives you an opportunity to get everything straight with the IRS before you really get into deep water. 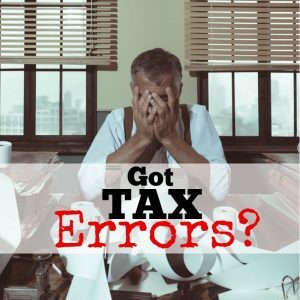 Our tax attorneys at Dallo Law Group can help decipher your -errors and ensure they are fixed before you are contacted by the IRS examination agents and required to answer. Such an exposure can lead up to huge penalties and interest and depending on the inaccuracies bring up fraud charges. It is always best to try to fix circumstances before you are contacted for questioning. Because our lawyers are CPAs as well, and because we have an abundance of experience with the IRS, you can rely on us to see you through your entire amended tax return process. A QAR is a special category of amended return and we can help you reap all the benefits of it. The last thing you want is to face unnecessary IRS penalties or worse yet, criminal charges when both can easily be avoided. If you have any questions or are ready to file an amended tax return, give us a call to discuss your circumstance: 619-795-8000.